Each step will have a bead and I am installing a bead track on the bottom face of each step. The steps/bench are not totally done, each will get about 2" of vermiculite. The bead liner will be attached to the blocks, then the vermiculite poured. Thanks and thanks. I like the idea of just mixing till damp on plywood, that is easy to do, and easy to pack in the voids. Funny, I thought things would move so much faster at the end, and it is almost like a standstill. 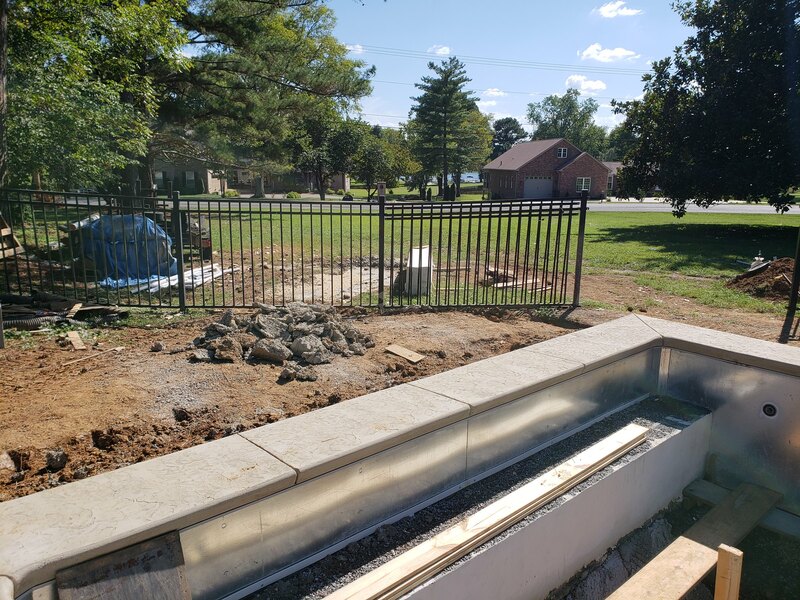 I have been working on electric and plumbing and some irrigation/drainage stuff...all of which takes time and really doesnt "look" like things are being done. I am doing the cantilever forms for the concrete coping, and as skillful as I like to pretend to be, that is a job that I think will just look so much better done by a concrete guy. The coping is almost done being formed, and planning to pour and stamp the coping Monday or Tuesday. Follow that with floor and liner, which is in my garage! Sad how such hard work does not show in pics but it is very needed! You will want to take pics of the plumbing and such for the future. You never know when you need it! Coping mostly completed, needs a light top coat and sealing which should make it pop a bit more. It is difficult to see in photos, but they used the rubber stamp to give it a natural stone finish. I plan to to finish up landscaping with some grading, topsoil, and will plant cool season rye for winter and next spring put down zoysia to match the rest of the yard, but it is too late in the year now. Kinda hard to see in photos, but that is the lake, so I can sit on my deep end bench and look out at the lake. LOL...and please forgive the mess...Im tired of our yard looking like the neighborhood dump, but we are almost there. Oh we don't even see the mess! 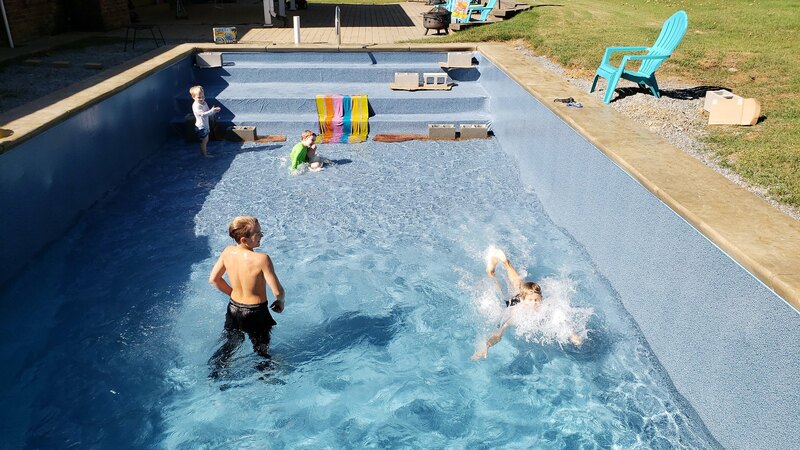 We see the fun you and yours will be having in the pool!!! That is some good progress you have going on there. Do you have your test kit yet? If not NOW is the time to order it as it will not be too much longer before you have water in that bad boy! can i ask what the compensation and benefits are for your crew? LOL...Ive had the test kit for a couple months. 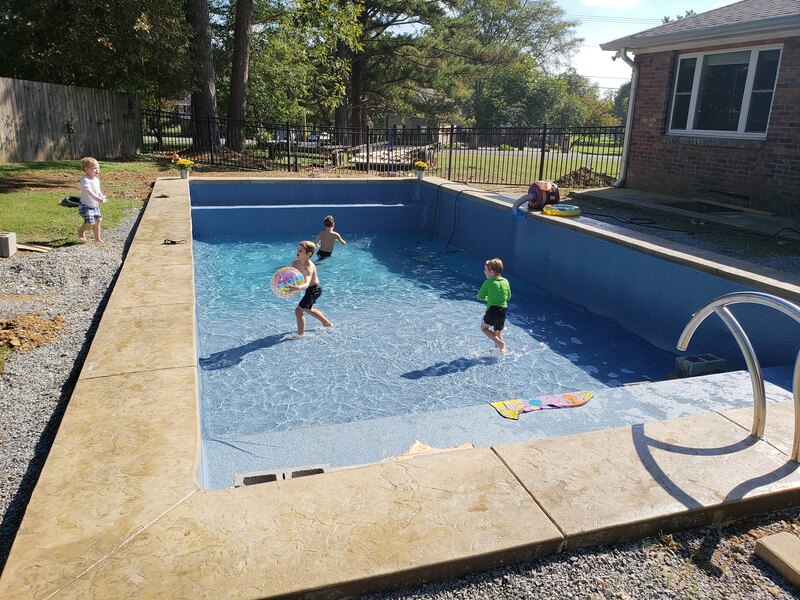 Ended up going with a 330k BTU Raypak natural gas heater, and middle TN usually has a very nice fall, so we should be able to get a month or so of swimming, but at least we can spend the fall sitting by the pool with pumpkin spice coffee! Im not entirely sure I understand what you are asking. 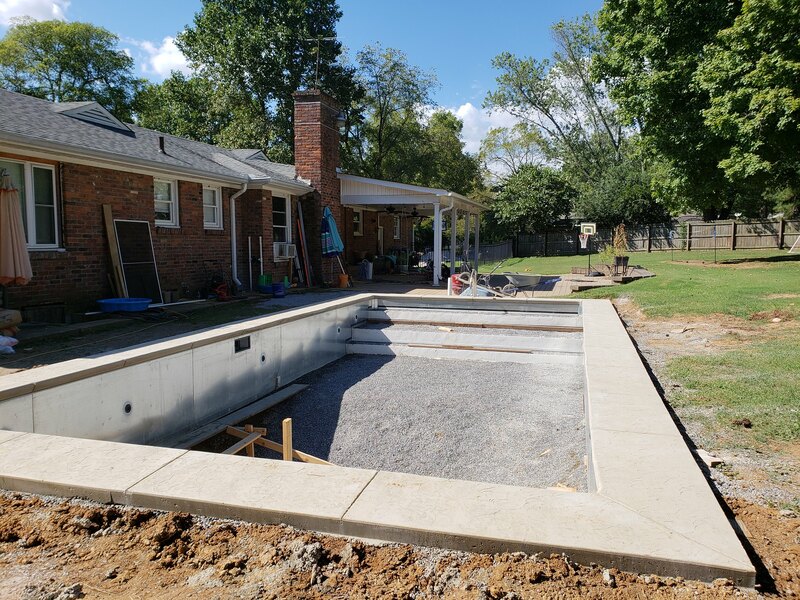 The only thing I have not done is the coping, and that was $4k which included styrofoam forms, actually building/forming, laying the rebar, the concrete color, the concrete plus delivery, and the labor to pour, finish, stamp, cleanup, and seal. They are also going to do the vermiculite floor in the next few days, so another $1500. SBall, You can and should fill out your signature. You are that close! THANKS! It is a good one! Funny stuff up there! in the beginning of the OP, i noticed your children were all hanging around the backhoe lol. i considered them your crew since this is all DIY. HA...yes, they are my crew! I was working on the electrical panel last night and my 3 year old was digging in the dirt with a couple screw drivers and he was "working" and my 8 year old was using a hacksaw to cut up some 2" PVC. LOL and it never ends. Got the floor finished Saturday evening right about 5pm and it starts to sprinkle. We got it covered with tarps/plastic, but it literally rained all day yesterday and all night, and storms until thursday. There is a foot of water in the deep end. Sigh. 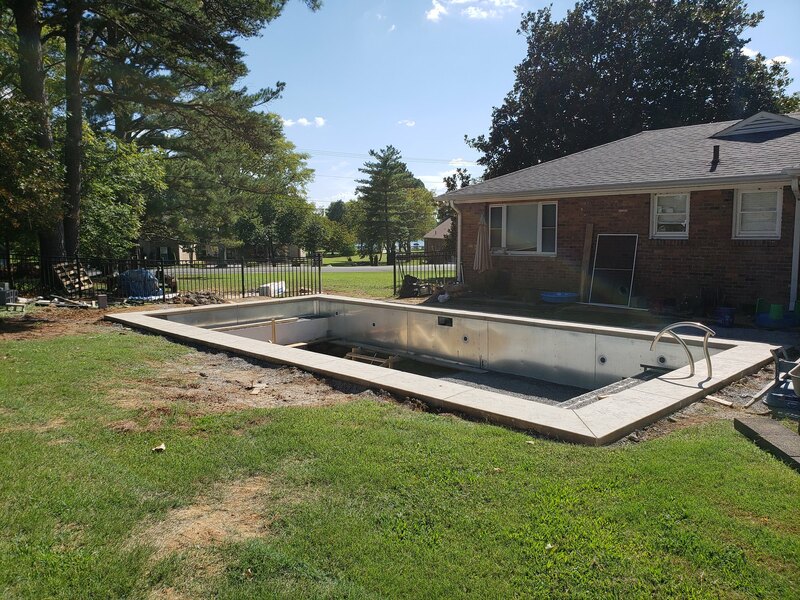 Most of it is ok, but there are parts of the deep end that are ruined, so wait for it to dry out, repair the bad spots, and hang liner. LOL. Thx. Storms supposed to wrap up tomorrow around lunch, planning to pump out all the water tomorrow evening, make any repairs thursday, final clean up and hang liner Friday. I'll grab a bag of portland. 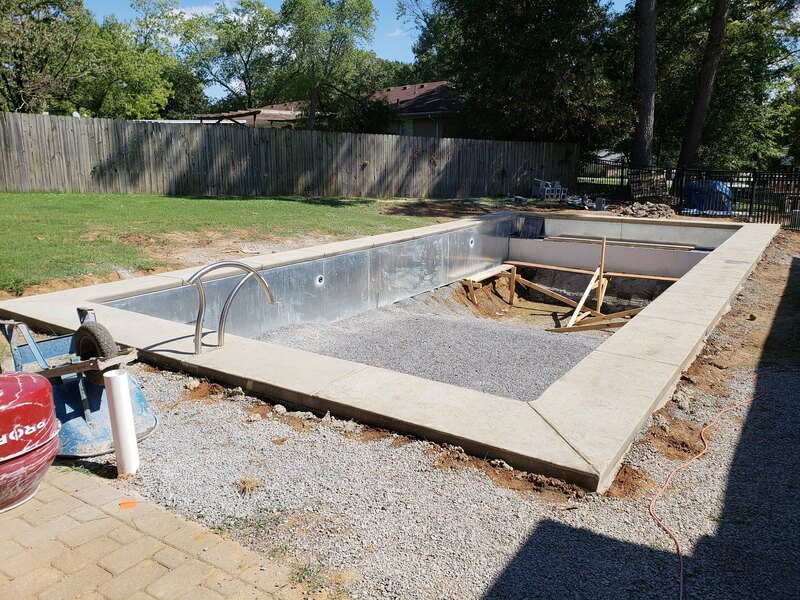 I still have 4-5 bags of Pool-krete for the larger spots in the deep end that got damaged. Just need a little more water and do final hookups...like the heater! Looks like they don't care how burrr it is! LOVE IT!!!! Wow, almost there!!! It is looking good and maybe another few weeks of swimming in with the heater.